Rock of Ages has uniquely perfected the artificial rock painting process by establishing an artisan approach to artificial rock rather than a “constructive” one. Through selective placement of base colors and composite layering of dark and light color values, we have mastered the ability to create illusions of rock separation and depth of separation through strategic and artistic paint applications using only the best and highest quality paint products in the industry. Our formulated process of rock painting can turn a not-so-great rock job into a visually appealing work of art, rather than an eyesore. Artificial rock, composed of concrete, carved and stamped to assimilate real rock allows a contractor to have much more control of the design, look and functionality of a pool, spa, waterfall, or pond. Building with artificial rock provides a structurally secure composition as a result of the amount of steel, rebar and concrete used in production. When my kids were growing up and they’d ask me, “Dad where do we run to if there’s an earthquake?” I would respond, “Run out back into the Rock Grotto”. Truth be told, it would take A LOT more than an earthquake to bring down a Rock of Ages water feature. Not only is it cost effective, but like natural rock, its’ lifespan is at least as long as that of the homeowner or the home that it is built upon. Artificial rock does however require simple maintenance over the years to maintain a brilliant and “like new” appeal to include repainting and sometimes, but not always rock repair work. 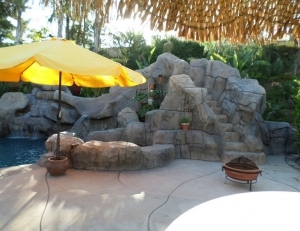 The original paint job for artificial rock coping around a pool, or rock water features built within the pool usually maintain their luster and dazzle for the first 5 years. In general, after about 3 years of construction, the sun’s UV rays, rain, and water from the pool will begin to impact the color of the rock which will experience a very slow fade. The evidence will be dependent upon the initial color scheme of the rock. Rock pools that are painted with muted grays and shades of crème will portray a natural rock appearance longer than rock that is painted in brilliant browns, golds and shades of green. A primary trigger for homeowners to schedule a repaint is when their water feature is showing signs of white effloresce that is popping out of the rock or streaming down the rock, becoming an eye sore. Efflorescence is the white chalky powder that you might find on the surface of a concrete structure or brick wall. It is purely a cosmetic issue, and is usually an indication of moisture intrusion from underneath the rock. Some effloresce is to be expected as is with even real rock water features. It’s really a personal preference as to when your rock will require a repaint to replenish the original gleam. Required only when the artificial rock in your pool or feature has suffered a severe crack or breakage, or when rusted rebar can be observed as a result of permeating the rock, or degeneration of concrete which can occur over many years, leaks in plumbing which require breaking through the existing rock followed by reconstruction, and lastly for cosmetic repair to reconstruct rock that was hideously built to begin with. 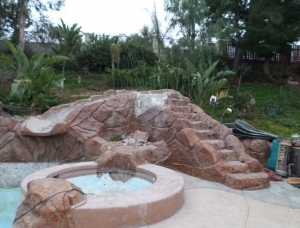 It is quite common for Rock of Ages Pools to attend to existing artificial rock changing the entire look of a rock scape project through new shape, edging, size and color.